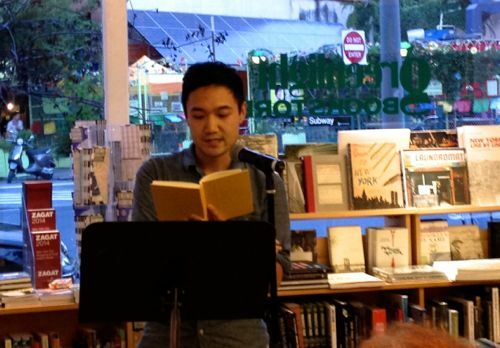 Paul Yoon’s debut novel, Snow Hunters, began when he had been researching Korean history while writing his acclaimed short story collection, Once The Shores. He begins the reading by explaining that while in the process of researching a story in the collection, he came across a tidbit about Korean soldiers after the Korean conflict ended. A group of North Koreans decided to immigrate to Brazil rather than return north after the war. He reads from the opening pages of the book with a precise and solemn voice. It is a practiced pace, though later he reveals he’s actively editing the book on the fly as he reads to the crowd. He is cutting sentences and words literally while reading. Nothing is ever finished, he’ll confess later. Part of his style is to constantly revise and cut. Though based on significant research, Yoon says that writing historical fiction in many ways is freeing. He’s unburdened by modernity and the expectations that come with it. Avoiding anachronistic elements is comparatively easier than writing within the constraints of the contemporary world. He devoted plenty of time to researching the world as well. He read up on Brazil’s history between the 1950s through the 1970s. He looked at lots of photographs hoping to understand the palette of the place, to understand the architecture. He describes a visual immersion in the setting. Much of the press coverage surrounding the novel discuss the length of the original manuscript, supposedly hundreds of pages. The resulting end product is comparatively short novel, thin, light and small. Yoon explains that he is a “maximist” when it comes to writing drafts. He prefers writing long narratives and then chopping the text down from there. He needs to know every detail of character. He invents back stories for characters may never even appear in the final story, but exist. Yoon also said he wrote the novel from multiple perspectives. He wrote a draft of the novel in the first person perspective, from the tailor, Kiyoshi. That didn’t work. He turned to the third person perspective because the rhythm felt better. He explains that as a younger writer, he felt more comfortable in the first person, but as he matured, the third person began to fit better. Yoon says he enjoyed the transition from stories to a novel. The longer length allowed him to saturate himself in the story and really involve himself in the characters. Still, its a very short little novel.